90 km from Dalaman Airport, 1.5 km from city center, 0.8 km to the beach, 1.5 km to the old bazaar, 1 km to Friday Market, 1 km to Migros Grossmarket, 0.7 km Hospital, 0.6 km Pharmacy, 1.5 km Bar Street, 0.8 km Beach Bars, 2.5 km Bus Station, 0.8 km Bus Station. Please click for google map and contact info. Dalaman Airport is the nearest airport to Marmaris. Along the summer season charter flights are available to Dalaman Airport from most european countries. Flights are available during the year from Istanbul, Ankara, Izmir to Dalaman airport. 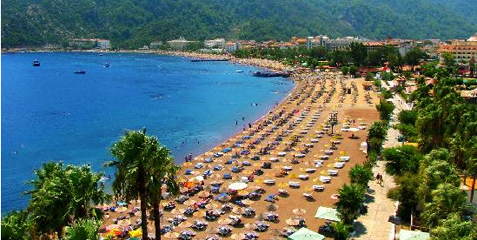 Buses are available almost everyday from Istanbul, Izmir, Ankara , Antalya directly to Marmaris. Along the summer season, everyday ferryboats are available from Marmaris to Rhodes. Also you can have a daily excursion to Rhodes. Dalaman airport is 90 km away from Marmaris. Bodrum airport 110 km, Izmir airport 240 km, Istanbul 850 km, Ankara 680 km, Antalya 320 km, Ephesus 200 km., Pamukkale 210 km, Rhodes 45 minutes by ferry. Situated on a bay, backed by rugged pine-clad mountains, Marmaris is one of the most attractive maritime parklands, ideal for water sports and sailing. It makes an excellent starting point for the "Blue Voyage" tour of the Aegean coastline. 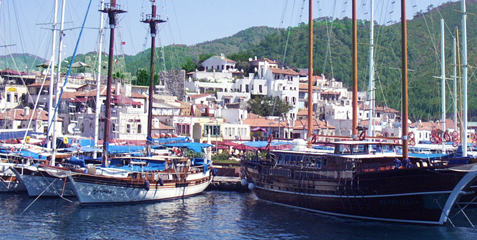 In May, the Marmaris Yacht Charter Show provides an opportunity to meet the yachts captains and crews. With plenty of provisions aboard you set sail in the craft of your choice and languidly explore the spectacular beauty of southern Turkey. It is not known when Marmaris was founded, but Phykos as Marmaris was previously known, was part of the Carian Empire in the 6th century B.C. The city became a part of the Ottoman Empire in 1425, and the castle was built in 1521 A.D. For use in a planned assault on Rhodes. The Ottoman Sultan at the time Kanuni Sultan Süleyman, change the name of the town to Mimaras, which then became Marmaris according to the historian Evliya Celebi. A local rumour has it that the reason for the change of name to Mimaras was that Süleyman, on returning from his expedition to Rhodes, disliked the castle and said: mimaras! Which means: hang the architect.